If you’re looking to make a big impression with stunning custom decals, we can manufacture them for you in house to the shape, size, colour and finish of your choosing. 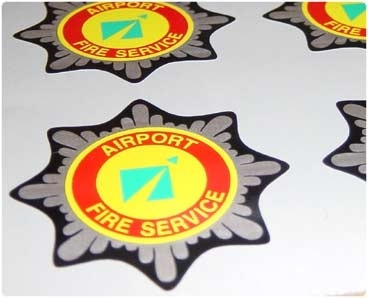 2G Products has been specialising in the manufacture of decals for the best part of two decades, and our products are typically found in harsh environment areas so you can be sure that they’re strong, durable and created to last. Whether you require decals for vehicles, factory flooring, office walls or products, we can meet your needs with a quick and efficient service. Each and every one we create is designed and printed for maximum durability, whilst we can also have them cut to custom shapes. They’re very suitable for outdoor use, so much so that they’re strong enough for years in the wettest and harshest weather conditions! One of the big advantages of choosing 2G Products to create your custom decals is because we focus on the industrial high durability end of the market. Each and every decal our team manufactures is designed to last, and we’ve supplied our products to a diverse range of harsh environment areas such as dive vessels, shipping containers, aircraft, medical, military and offshore type industries as well as precision electronic applications. Whether you require custom decals in the form of vinyl lettering, wraps, wall art or stickers, we can supply products of the highest quality. We know exactly what’s required to create a decal that not only looks great and does the job, but also stands the test of time. Our personalised decals can be used to transform an ordinary surface into an eye-catching, vibrant promotion that makes a big impact. Whatever application you have in mind, we’re confident we can provide a solution, and our friendly team is here to help with your order every step of the way. We work closely with our customers to create custom decals that make an impact, sow whether you require letting that will look sharp on your shop’s windows, or require some decals for your van or lorry that will withstand the harsh weather conditions, we can meet your needs. We also specialise in the manufacture of front panels and nameplates, whilst we can accurately dye aluminium sheet beneath the sapphire hard anodised layer for the ultimate in robustness. Thanks for taking the time to read more about us and our highly durable decals. Whatever design you have in mind, all you need to do is get in touch with a member of our team today on 01224 682 682 and we can start discussing your requirements in more detail. Alternatively, you can email us at 2g@2gproducts.co.uk and a member of our team will be back in touch as soon as we can.